As a “Yank” I’ve never had a horse in the race regarding the movement for Scottish Independence from the UK. Frankly, I’ve never understood the argument from the secessionists but certainly have recognized the “William Wallace” pride associated with being Scottish. Soooo, it has seemed to me that the two countries are better off with another than they are apart and I hope that since Scotland has chosen to remain united with the UK the concerns of independence movement can be addressed. My wife visited Scotland a number of years ago and knowing my interest in the UK (and Highland) history she bought me a boat load of postcards. Piper Kenneth McKay, 79th Cameron Highlanders at Waterloo, by Lockhart Bogle. Piper McKay is my favorite. 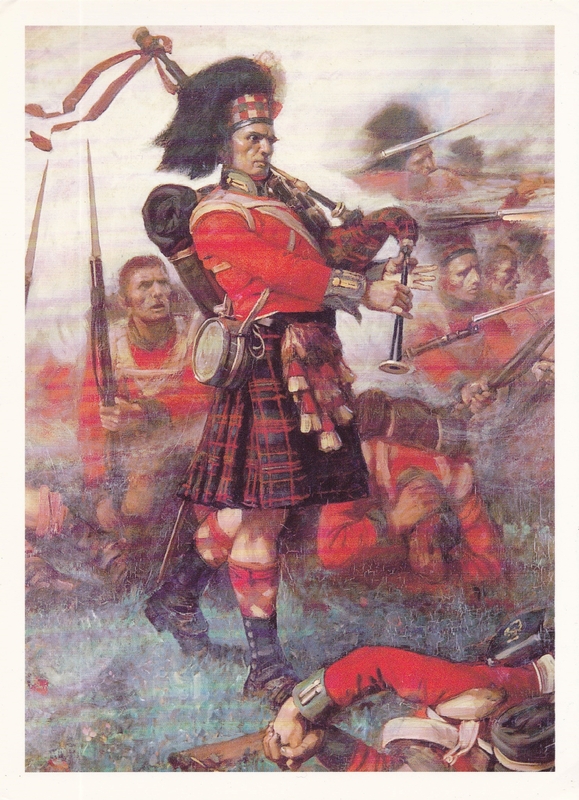 The Highland Brigade (42nd, 79th, 92nd Highland Regiments) at Waterloo covered itself with glory with drums beating and the pipes belting out Scotland the Brave. 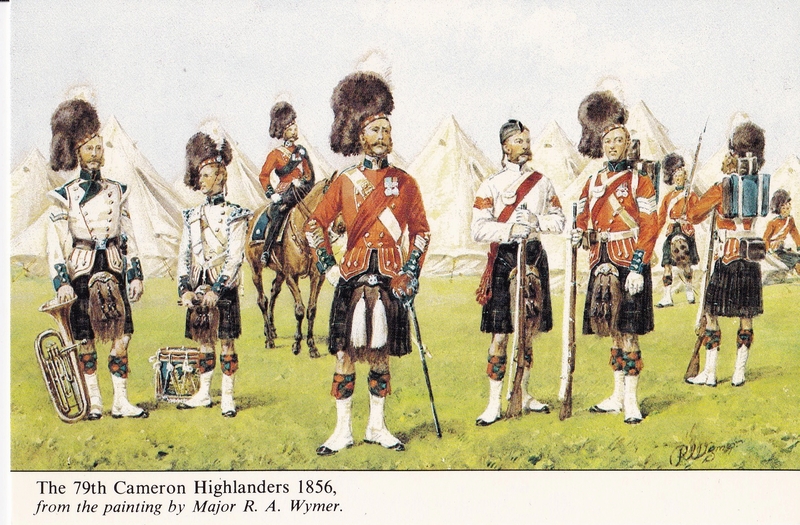 This post card depicts the 79th Cameron Highlanders in the uniform of the Crimean War where they gained fame as part of the Thin Red Line at the Battle of the Alma. 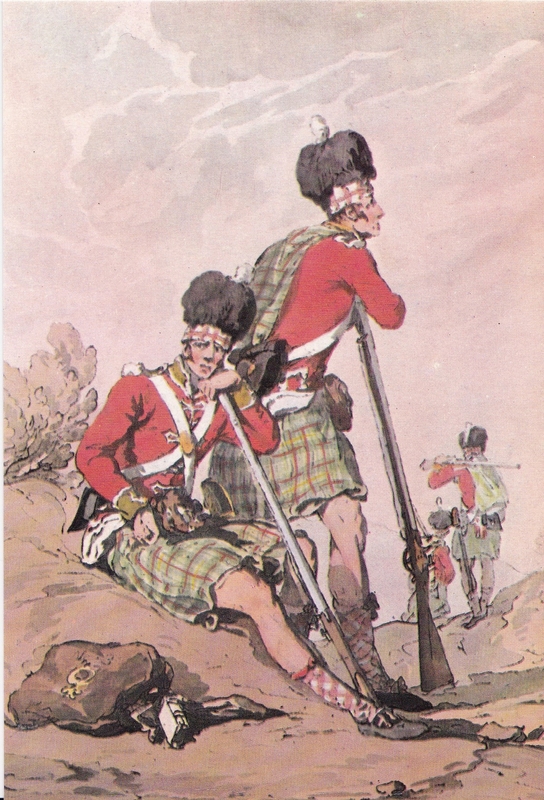 This postcard does not identify the regiment but since it was published by R. H. Q., Queen’s Own Highlanders (now the Seaforth and Camerons) I am assuming that the original print sought to depict the 79th in their 1807 kilt pattern.